NASHVILLE, Tenn. (WKRN) - As Nashville Predators fans poured into Bridgestone Arena Wednesday night for the Preds' first game against the Dallas Stars, PETA was there to meet them. PETA supporters arrived at the game with boxes full of free fish-shaped stress balls with the message, “Respect Animals”, printed on them. While PETA's intent was to hand out catfish-shaped stress balls, they accidentally ended up handing out bass-shaped ones. 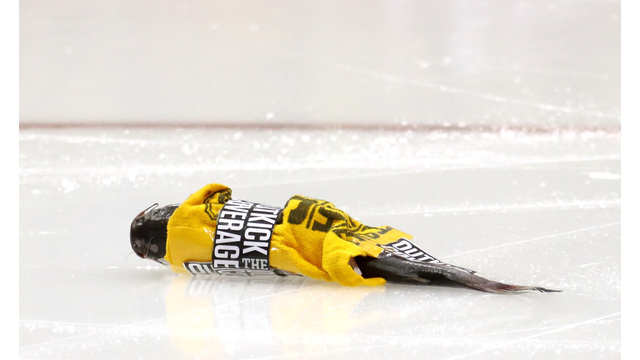 PETA says the effort is to get Preds fans to stop throwing real Catfish on the ice, which has become a Nashville playoff tradition. The group also proposed that Preds fans be checked at the door for hidden catfish and that consequences should include immediate ejection, a lifelong ban on attending games, and a fine of $5,000 for attempting to bring the Catfish in the arena.